The “wish tree” on the picturesque Greek island of Antipaxos in the Ionian Sea has become a tourist attraction, as every year hundreds leave their wish there hoping it will come true. Visitors of the idyllic Vrika beach on the island want to touch the magic wish tree and write their own wish on a white pebble. 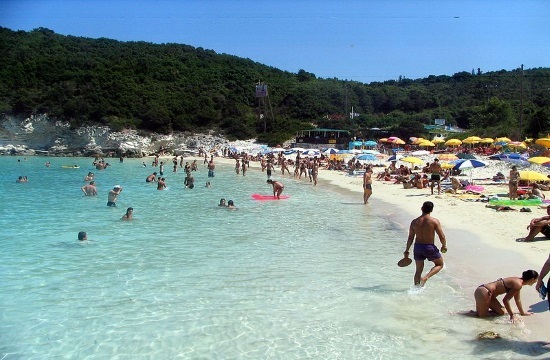 “The famous tree of wishes is a gorgeous centuries-old pine tree with its branches touching the fine white sand of the small emerald beach of Vrika,” Antipaxos Deputy Mayor Giorgos Lichnos told the Athens News Agency. He added that the old tree carries a unique magic that draws tourists either to touch it or to take pictures of it or to write their wishes on white pebbles and leave them on its roots and branches. An elderly man of Antipaxos who has lived all his life there, Mr Spyros, told ANA that the “tree of wishes” or “thank-you tree”, as locals used to call it, always had its own magic so that the village girls were asking it to reveal who they were going to love or wished upon it to find true love. Every year, hundreds, even thousands, of tourists come to the famous cove of the little island to leave their wishes on the tree and enjoy the fine white sand and the turquoise waters of Vrika Beach.